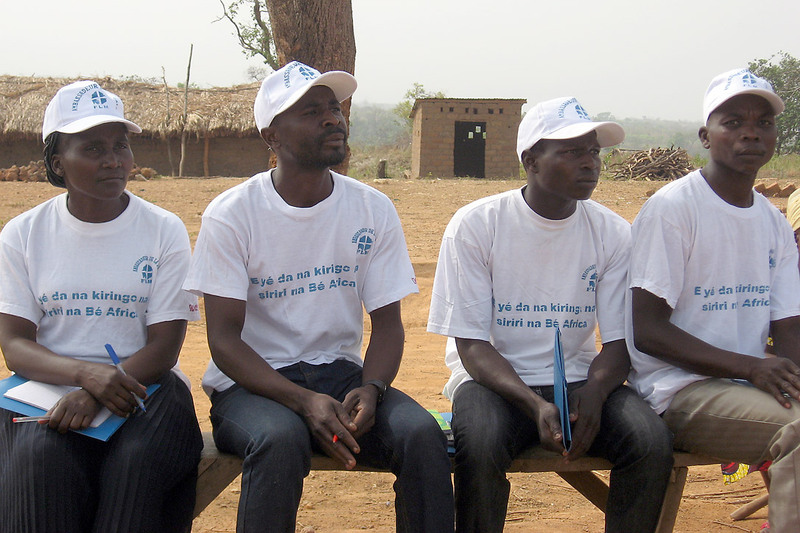 In west CAR, one of the activities of The Lutheran World Federation is training young people to become peace ambassadors in their villages. The young men and women mediate in community conflicts, which can vary from a fight about the village water point to accusations of witchcraft to domestic violence because of alcohol abuse. I am in the western Central African Republic provincial town to visit Lutheran World Federation and Finn Church Aid projects that are supported by ICCO and Kerk in Actie, financed by the Dutch Ministry of Foreign Affairs. On a Saturday afternoon Jérome and his assistant Seydi emphasize that the situation is currently calm in Bouar.But it is a fragile tranquillity that can easily be disrupted. In 2013, armed gangs started fighting and ten thousands of people fled across the border to neighbouring Cameroon. At first this might have looked like a fight between Christians and Muslims, but during my stay everyone tells me it is not a religious conflict. 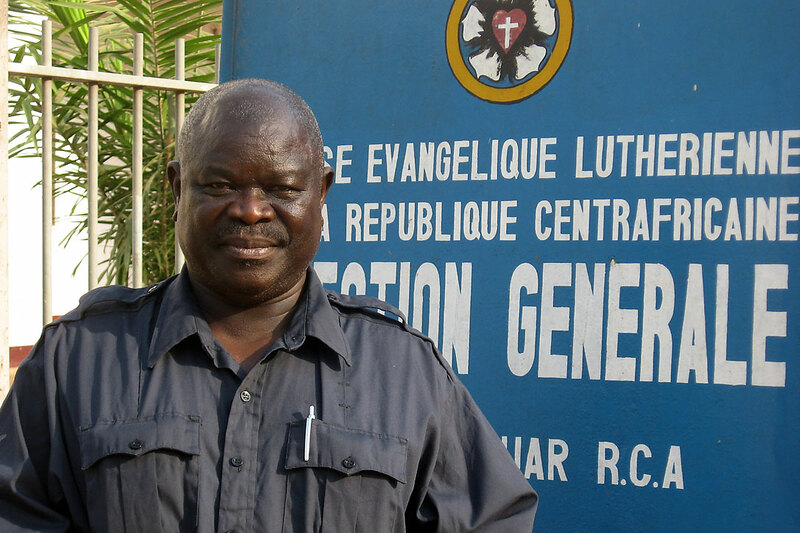 For instance, Michel Doko, treasurer of the Lutheran church in Bouar says, “Until the fighting began in 2013, Muslims and Christians had always lived here peacefully together. Therefore we immediately initiated a dialogue with our Muslim neighbours, for which we received the support of ACT Alliance.” ACT is the ecumenical global network of churches and church-based development organisations, of which the LWF is a member. Start talking to each other and remain talking. In a way, talking is like a red thread connecting my encounters in the Central African Republic. One of the activities of The Lutheran World Federation in Bouar is training young people to become peace ambassadors in their villages. The young men and women mediate community conflicts, which vary from a fight about the village water point to accusations of witchcraft to domestic violence because of alcohol abuse. In an effort to unite the different community groups, the ambassadors also organize cultural and sports activities. For instance in Dai, a small village some 25 kilometres from Bouar, the enthusiastic ambassadors tell us about a theatrical performance in their village. The theme was the violence of 2013, the Christians who destroyed houses and shops of Muslims, and how this affected the people. Afterwards, the community talked about the performance and slowly a first step of mutual understanding was taken. A similar story is shared by Martine, who is responsible for the Finn Church Aid peacebuilding program. How can you start building peace, when so much violence, pain and mistrust has been going on? You have to start very small, very close to the people, victims as well as perpetrators. First you start with one-to-one conversations, during which each tells his or her story to the other. Then slowly the circle grows. Talking about your pain, sorrow and worries helps when you do this in a trusted environment. Finally, you are asked if you are able and willing to tell your story to people you consider your opponents and as the ones who have caused your grief. Starting to talk with each other, and remain talking. In a way it is like a red thread connecting my encounters in the Central African Republic. It is a long process, but it works. It is a method of reinstating the mutual trust within a community that has to continue living together. Religion is not the cause of the violence, then where did the violence originate? For many years armed gangs have been fighting together in the Central African Republic. The causes can be found in the structural poverty of the country, the fragile state of the government, and the robbery of natural resources. The country is rich in natural resources such as gold, diamonds, oil and uranium. This attracts profiteers: first colonizers from France, then businesses from Lebanon and later from China. The armed gangs that started the fighting also try to get their share of this richness, of which the general population does not benefit at all. Because the government is weak and practically absent in large parts of the country, impunity reigns and violence flares up regularly. Last year a new president was elected and with him came the hope of lasting peace. The situation has indeed become more tranquil but not all armed groups have signed the disarmament agreement as of yet. This agreement should pave the way for foreign investments in order to initiate the country’s development. The programs of the Lutheran World Federation and Finn Church Aid are important steps on the road to sustainable peace. Siriri or peace as the Central Africans say in Sango, one of the main languages in the country. Together we help to break the vicious circle and prepare the road to lasting peace and development.